Final preparations are underway for the 28th Rock and Roll Hall of Fame induction ceremony on April 18th at the Nokia Theatre in Los Angeles. In addition to performances by this year's living inductees – Rush, Public Enemy, Randy Newman and Heart – Christina Aguilera and Jennifer Hudson will sing in honor of the late Donna Summer and Gary Clark Jr. and John Mayer will pay tribute to the late blues great Albert King. Usher will perform a tribute to Quincy Jones and Cheech and Chong will induct producer Lou Adler in honor of both artists' Lifetime Achievement Awards. Among the show's other stars will be Foo Fighters members Dave Grohl and Taylor Hawkins (inducting Rush), Don Henley (inducting Randy Newman), and Spike Lee and Harry Belafonte (inducting Public Enemy). The show will be broadcast on May 18th on HBO. Every living artist being inducted is set to attend this year, and onstage reunions are possible. The 2013 ceremony is shaping up quite differently than last year's event at Cleveland Public Hall, where Axl Rose backed out days before the event, Rod Stewart contracted strep throat and was unable to fly out for a planned reunion with the Faces, late Beastie Boy Adam Yauch was ill and unable to appear with his bandmates, and Red Hot Chili Peppers guitarist John Frusciante and Guns N' Roses guitarist Izzy Stradlin also stayed home. "There's always drama," Rock and Roll Hall of Fame President and CEO Joel Peresman tells Rolling Stone. "Last year was unquestionably different than most, but this year came together a little quicker, a little faster." 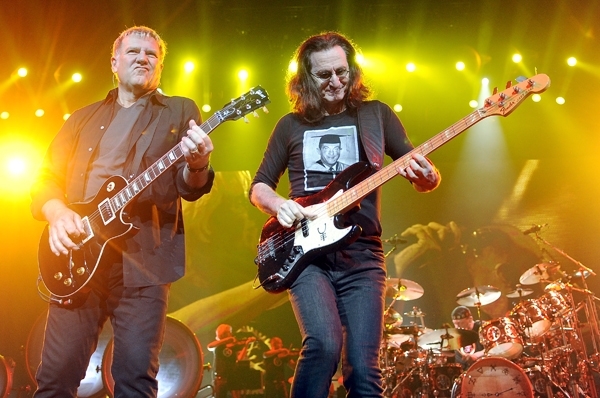 The 2013 induction ceremony has made waves with Rush fans, who have been loudly petitioning for the Canadian rockers' inclusion for many years. It's unclear what material Rush will perform at the ceremony, but it's quite possible they will perform with Taylor Hawkins and Dave Grohl. "Dave and Taylor were one of the first people we thought about to induct Rush," says Peresman. "They said 'yes' in about two seconds. I'm hopeful [they'll play together]. More than a few times in the past, people have got caught in the moment and decide to perform. That's what happened last year with Green Day – they were just there to present an award to Guns N' Roses and after hanging around rehearsals, they decided to play." When Rolling Stone spoke to Ann and Nancy Wilson of Heart last December, they said they were unwilling to reunite the classic 1970s lineup of the band. "We've been playing with our new band much longer," said Ann. "This is one of those things we need to dust off among ourselves." It's possible their position has changed since then, but Peresman remains somewhat cagey. "They're working it," he says. Randy Newman will perform with John Fogerty and Jackson Browne. "We were looking for some ideas of L.A.-based inductees to play with Randy," says Peresman. "John Fogerty was suggested and he really liked the idea." Cheech and Chong are set to induct Lou Adler, the director of their 1978 classic film Up in Smoke. "They have to get on a plane right after their performance and take a red eye to Ontario for a show," notes Peresman. "Lou meant so much to them." Carole King – whose classic 1971 album Tapestry was produced by Adler – will perform after their speech. Even Public Enemy DJ Terminator X – who now works as an ostrich farmer – is planning to attend the event. He left the group in 1999 and has been largely off the grid every since. "I requested a contact for him and a month passed by and nothing happened," says Peresman. "Finally, one of our production people did some kind of database search to write him a letter to find him. He said nobody had reached out, but he would be honored. He's coming and bringing his father. Chuck D asked us his for his contact. We hope they get in touch." The Rock and Roll Hall of Fame induction event typically concludes with an all-star jam, though it's a bit hard to picture one within this year's diverse lineup. "I can see Chuck D rapping something and Flavor Flav doing something with the guys from Rush onstage," says Peresman. "You have Dave Grohl around, Don Henley there . . . Who knows what will happen? We have some very interesting people." This year also marks the second time the event has ever been held in Los Angeles. "It makes it easier from a production standpoint," says Peresman. "A lot of the crew are L.A. based, as well as the performers and presenters." The event is usually held at New York's Waldorf Astoria ballroom and is mostly closed to the public. Starting in 2009, however, they began staging it at Cleveland's Public Hall every third year. "Six thousand people fit in that room and the energy is just terrific," adds Peresman. "The first time we did it in Cleveland, one of the managers of one of the acts was angry that we were in Cleveland. After the show, he came to me and said, 'If any of the acts ever get inducted again, I only want the show to be in Cleveland.'" The induction ceremony will return to New York next year. It is already getting Nirvana fans buzzing, as the grunge rockers will be eligible for induction for the first time; artists are allowed in 25 years after the release of their first single or album, and the band's debut LP Bleach came out in 1989. Tickets to this year's show are sold out, but limited benefit-level tickets and packages are available through LPA Events. Contact lauran@lpaevents.com for more information.